Day two of our final weekend, we began with our circle, which always consists of shares, business, scheduling, ideas, tears, fears, celebrations … kind of like the breakfast table in many homes. With initial business over, we began our final 90-minute practice together. We placed our mats in a circle facing each other, and took turns leading 5-10 minutes each of the lesson off the cuff. As we settled into savasana, which for those of you who have never been to a yoga class, it’s the final 5-10 minutes where you surrender your practice, soaking in the rewards of what you’ve just offered up to your body. It usually feels like heaven, muscles finally at rest after such a hard work out. I truly love savasana. The music playing was a song I’ve never heard before, 10,000 miles by Sleeping at Last. I could hear some of the words, not all, but I caught a line here and there, fare you well, I’m going away but I’ll be back … if I go ten thousand miles …. You have been a friend to me. The tears streamed down my face for the entire song. Interesting how the universe offers up always something right on point, even if it’s just a song. I looked the song up later, so beautiful. Speaks, if I understand it, to a romantic love, but in the end, all love is universal. We spent the following four hours practicing and drilling ourselves on instruction, until it was time for our final hike. It was billed as a “team-building exercise.” It certainly was all that, and so much more. We began our hike at the confluence down at the base of the American River, hiked for probably two minutes on straight ground, and then headed up, straight up the mountain to the bridge above. I, still, brought up the rear, but that was okay. I wasn’t crying, just out of breath. My same team of sweethearts accompanied me, Kyleigh, Molly and Julie. I have such a soft spot in my heart for caretakers … angels on earth to be certain. We brought up the rear and as we reached the top, it was simply beautiful. What I probably love the most, is that I see this trail every day I drive over the bridge, and after Saturday, I can now say to myself, hey, I hiked that steep hill. Nice accomplishment, and I know it will forever now be a precious memory. But the day was far from over. As a matter of fact, we had just begun. My stomach turned a bit as I waited to hear what our next obstacle would be. 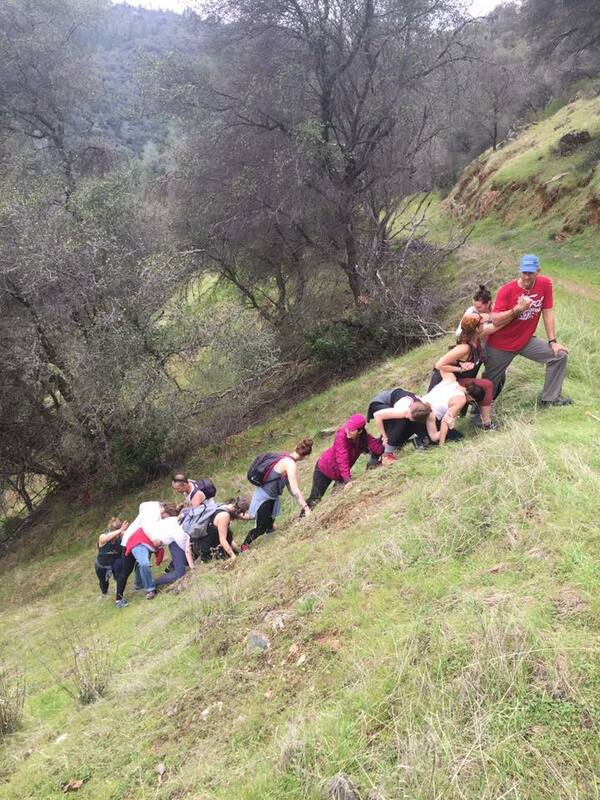 As we got a ways down the hill, Scott showed us what our challenge was… a steep hill that we would climb down together, as a team, person by person climbing down holding on to the next making a human chain. For once, I wasn’t the most apprehensive person. I actually thought it was kind of fun. We made our way down, one person at a time, taking probably thirty minutes. And while it was a bit scary, I think for the most part it was exhilarating, and such good fun. When we finished the hill, he gave us the option to do one more hill, even longer and steeper, and we unanimously decided to go for it. I haven’t laughed that hard in a long time. I hung on to people for dear life, I stopped others from sliding past, I slid down on the back of another like we were on a sled in the snow … all and all, it was just so doggone much fun. What a wonderful way to celebrate the close of our journey. We returned to our cars each of us covered in dirt and the beauty of the human spirit. We humans are just so damn good for each other when we share the best of ourselves. One last day to spend together in this group, Sunday was approaching at Godspeed. Again, congrats on your graduation! I’m so glad you did this and didn’t let anything stop you from completing it. After catching on the blog this morning, I’ve already come up with few entries that I’ll be able to put into my Gratitude Journal and that puts a smile on my face. Peter, it’s hard to put into words how much it means when a reader reacts like you do. It’s what, in the end, keeps a writer writing. You are my dear friend for many reasons, but your reaction to my blog is just another reason I love you. Thanks for all of these comments. Such fun!